I quite liked running before I had children, but now - I'm not great (long story - might get back one day!). My last 5km was one of the events associated with the Mooloolaba triathlon and it was hardly encouraging to walk back along the course and see officials clearing up! Thankfully I wasn't still on it!! Despite my low intensity I used to get the odd chafe but suffered more from hot spots in my shoes. Changing to some zero drop running shoes (Altra) that have a wider fit have really helped - less restrictive on my toes and REALLY comfortable. But now...(cue trumpets) ...I have an unlimited supply of the Skin Strong chafe protection range! "I recently tested DUST over 40km of trail running through mangroves, mud, salt pans, beaches, road, rass in my trusty Inov8's X-Talons 212 and noticed that my feet remained blister, callous and infection free. I started the run with a few cracks in the balls of my feet, slightly infected, a bit swollen so it was the perfect breeding ground for a food infection. I ran through every bit of mud and mangrove I could find testing out the DUST and found it really did help my feet... I will be using it from now on for all my training and races." 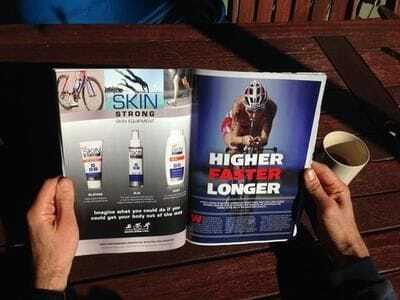 If you would like more info on how to use Skin Strong to avoid the rub on your next run - give us a call!